If a picture is truly worth a thousand words, then imagery may be the most effective way to deal with mental health problems. By replacing a thousand words describing how the mind functions with one simple picture, we get a clearer view of the changes we need to make. With our potential for change in sight, we realize that we are not only in control of our minds, but our destiny as well. we can change “who we are”. All ideas and inventions start out as a thought in someone’s head. Uber was first a thought before it was manifested into society. Drive-thrus began as a thought in someone’s head before they were built. Amazon was first a thought. All concepts and companies were first thoughts that manifested themselves into reality through hard work and perseverance. Thus, if we look at the outside world, we can visualize how our brains function internally. If every idea starts in the mind and manifests itself into the external world, then we can look at the external world to see what is in the mind. efficient at whatever we do. So how does this relate to YouTube? While on YouTube, you may have noticed that the homepage seems to “know” what you like to watch. It seems to always recommend videos that you enjoy. How is that? How does YouTube seem to know what you want? It knows what we want because the format of YouTube is just like the format of our minds. When you look at YouTube, you find that the videos that you have watched form the basis of what is currently on your homepage. There are sections like Recently Played, Recommended, Genre (based on your preference) and Rediscover Videos You Love. Based on the videos that you have had an affinity for watching, YouTube displays videos that you are most likely going to enjoy. For example, if you watch a lot of cat videos, there are probably a lot of cat-related videos plastered on your homepage. YouTube displays these videos on your homepage to make using their site faster and more efficient. 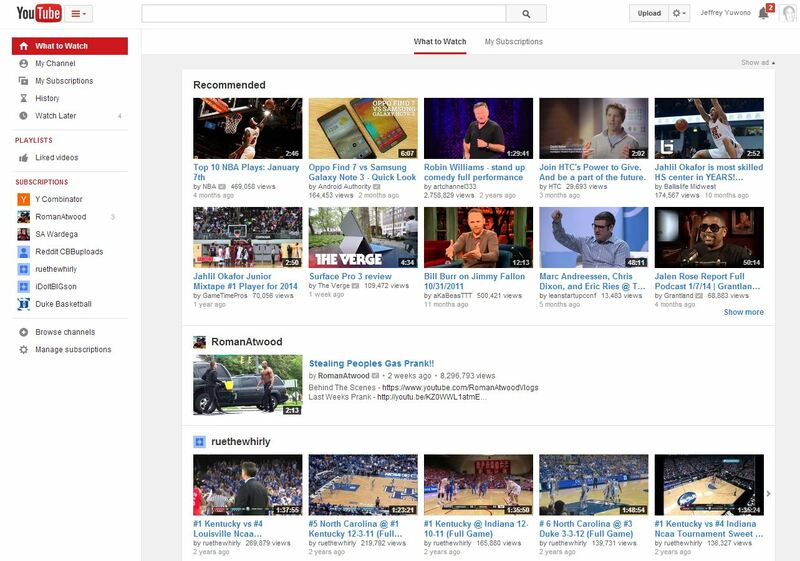 The sole purpose of YouTube’s homepage is to provide the quickest and easiest platform for you to get to where you want to go. The human brain works in the same way. It is constantly listening to you. It is listening to your thoughts, words and actions on a regular basis so it can connect neural networks to make your thoughts, words and actions easier and quicker to perform. If you are constantly worrying and over thinking about the worst in life, your brain is listening. Your brain learns that you have an affinity for worrying, so it plasters a genre station of worrying on your mental homepage. Thus, when an event occurs in your life, you will naturally fall into this habit. You will naturally see the event through your negative lens. Similar to when you open YouTube, you will more easily and naturally click on a cat video because it is clearly in open view on your homepage. What happens on YouTube when you click a video? You watch the video in the center of the screen. But on the right side, there is a section called “Up Next”. Essentially, YouTube has come up with a list of videos that are similar and relevant to the video you are currently watching. It does this to make the process of watching faster and more efficient (so you watch more videos and make them more money). In your brain, the same thing happens. If you decide to choose a negative thought, the brain makes it more likely for you to choose another negative thought. In YouTube, after the video completes, the next video plays automatically. If you do not select a different video, you will continue to watch videos of a related genre. The same thing goes on in your mind. If you think an anxious thought and don’t catch yourself or change your way of thinking, you will continue to go down a path of negativity and anxiety. Naturally, your brain decides to listen and provide you with a thought just like the one you just had. It is making your patterns of thought easier and more efficient to complete. With enough attention, a certain type of thought will become embedded in your mental homepage for more efficient access. Using this visual, we can begin to realize that the way we think is simply a formation of the dominant thoughts and actions and words that we have chosen over our life experience. Neuroplasticity is the ability of the brain to form and reorganize synaptic connections, especially in response to learning or experience. Thanks to neuroplasticity, our brains are malleable allowing us to change the way we think. Just like we can change what is on our YouTube homepage. Currently, we all have a homepage of habitual thoughts, words and actions that make us “who we are”. But these, just like the homepage of YouTube, can change by searching for other ways of thinking. By changing our habits, we can create a new mental homepage. With this new and positive mental homepage, we will approach life naturally and more efficiently in a better way. Thus, with these new natural and habitual thoughts and actions, we change our lives. Always remember that you are in control. Your brain might have a mental homepage of negativity that tempts you on a daily basis, but you are the one who ultimately decides to partake. Your consciousness is the person at the computer. Your brain is simply the YouTube website. Even though your habitual thoughts and actions are plastered on your mental homepage screaming to be clicked upon, you have the ability to search for a new and positive life. You are in control. Choose positive, and you will naturally become positive. Choose happy, and happiness will become your natural way of thinking.